Fall is quickly turning into winter, but that’s no reason to pack away the grill! There’s still plenty of time to get together with friends and family, watch a game or two and grill up a delicious meal. And with S.O.S®, clean-up is quick and easy. Here’s an oh-so-simple grilled kabob recipe to get you in the mood. All it takes are a few vegetables, your choice of protein and an easy-to-make sauce. Simple to prepare and delicious! *Use chicken or shrimp, if desired. **If using wood skewers, soak in water for 20 minutes before putting kabobs on the grill. Mix stir-fry sauce and honey in a bowl; set aside. Combine garlic powder, ground ginger and ground black pepper in a separate bowl. 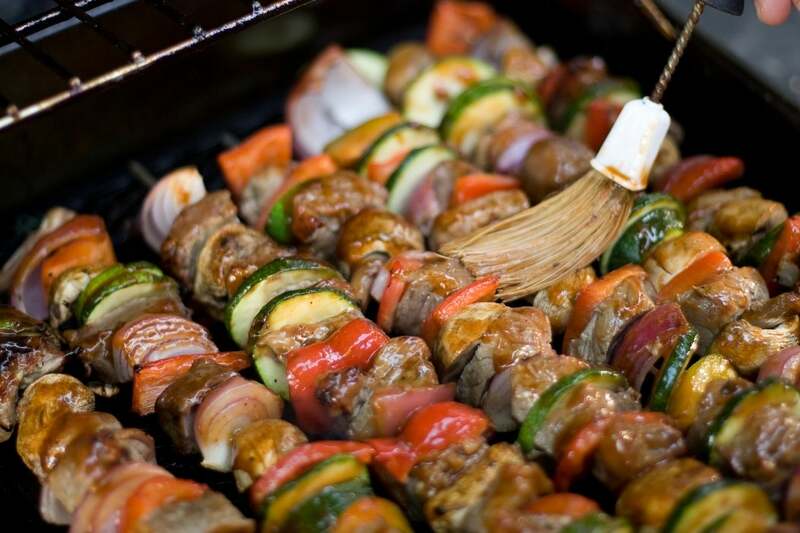 Arrange beef cubes and cut vegetables on skewers; evenly sprinkle with spice mix. Add skewers to grill for two to three minutes. Flip and brush with teriyaki-honey sauce using a pastry brush. Grill for an additional two to three minutes. Flip again and brush sauce on kabobs. Grill for two more minutes. Enjoy your kebabs with a side of chips and dip, jambalaya or any of your favorite dishes. Remove the grill grate (after it’s cooled). Scrub the grate until grime loosens. Easy! Cleaning your grill post-get together ensures it’s ready to go for your next meal. How do you keep your grill clean? Or, do you have a different cleaning or organization tip? Share it on the S.O.S Facebook page or tweet it with the #SOSWhoKnew hashtag. Don’t forget to follow us on Facebook, Twitter and Pinterest, too! We love BBQ season, because it brings our family together. To make it even more enjoyable this summer, we thought it would be beneficial to learn about how to properly clean a grill. It is good to know that one should start by removing the grill grate after it is cooled. I am glad to know that one should scrub the grate until the grime loosens. We will have to try this, thanks for the instructions.